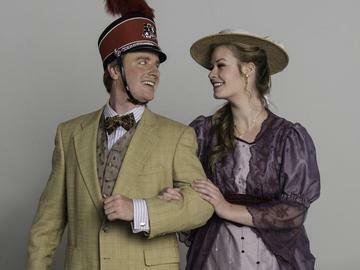 By turns funny, warm, romantic and touching, The Music Man is family entertainment at its best. Meredith Wilson's six-time, TONY Award winning musical comedy follows fast-talking traveling salesman Harold Hill as he cons the people of River City, Iowa into buying instruments and uniforms for a boys' band he vows to organize - this despite the fact he doesn't know a trombone from a treble clef. His plans to skip town with the cash are foiled when he falls in love with Marian the librarian, who transforms him into a respectable citizen by curtain's fall. Book, Music, and Lyrics by Meredith Willson. Based on a story by Meredith Willson and Franklin Lacey. Directed by Sam WIlliams. Orchestra Conducted by Susan Hamre. Choreography by Sam Williams and Sarah Souther. Vocal Direction by Tracy Martin Shearer. Friday Oct. 16 will be ASL interpreted. To purchase tickets in the ASL section, please choose tickets in the Right section. Rows B-J are primary. Rows M-Q in Right2 are second group. The interpreters will be in front of row A on the right side. Optional Dinner Theatre night Saturday Oct. 17. Dinner at the four star Oak Cafe on campus at 5:30, followed by the production. Sunday Oct. 18 has the added bonus of the free Ice Cream Sociable at intermission hosted by the Sacramento Area Regional Theatre Association.